The new partnership will enhance the ArtPrize Fellowship for Emerging Curators program for both fellows and partner institutions. GRAND RAPIDS, Michigan, February 24, 2016 -- ArtPrize, the radically open international art competition decided equally by public vote and expert jury, today announced an exciting new partnership with New York-based non-profit Independent Curators International (ICI). ICI is slated to develop and facilitate a three-part Curatorial Mentorship program to take place in Grand Rapids, Michigan -- intended to enhance the experience of curators and partner institutions participating in the ArtPrize Fellowship for Emerging Curators program. The program will close with a public roundtable discussion during the eighth annual ArtPrize event. ArtPrize is now accepting applications for 2016 curatorial Fellows. Information about how to apply is available here. Four Fellows will be selected to work under the guidance of curators at the Grand Rapids Art Museum, Kendall College of Art and Design, SiTE:LAB, and Urban Institute for Contemporary Arts -- assisting in the planning of the institutional Venue’s ArtPrize 2016 exhibition as well as curating their own ArtPrize Venue. Fellows are paid a stipend. The partnership with ICI will provide ArtPrize Fellows and partner institutions with the opportunity to connect with curators working on the national and international level, and to learn from those working at the forefront of the practice. The ICI Curatorial Mentorship Program will include presentations by Renaud Proch, ICI Executive Director, and María del Carmen Carrión, ICI Director of Programming and Research, as well as additional guest curators drawn from ICI’s extensive network. "We're looking forward to teaming up with ArtPrize and their partners in Grand Rapids on the Fellowship for Emerging Curators program," noted Proch. "This new collaboration will provide the curators in the program a framework for further professional development, and a connection to ICI's international networks." ArtPrize Fellowship for Emerging Curators, which debuted in 2015, is part of an expanding portfolio of ArtPrize granting programs -- and will offer a total of $40,000, divided evenly among the participating venues and their respective Fellows, to aid in the planning and execution of their ArtPrize 2016 exhibitions. 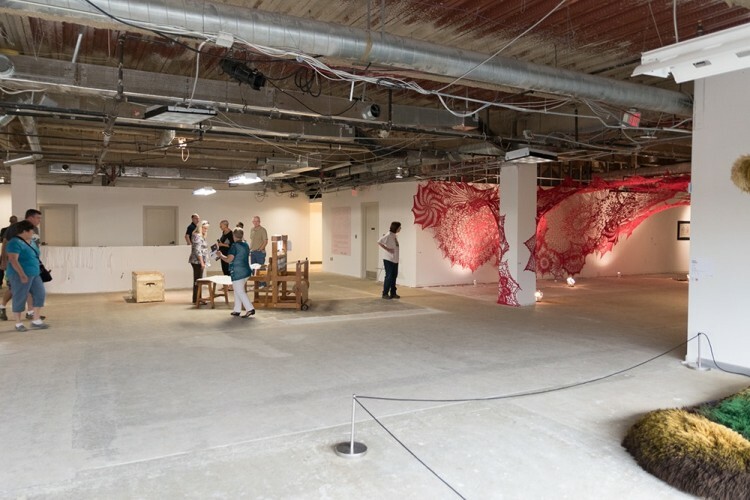 In 2015, ‘Processing Fiber at 250 Monroe’ -- curated by ArtPrize Fellow Elizabeth Hertl -- was nominated to the Jurors’ Shortlist for Outstanding Venue. Emerging curators living and working in the Midwest are encouraged to apply for a 2016 fellowship position by March 17, 2016. Questions about the program should directed to curators@artprize.org. Information about how to apply is available here. ArtPrize will once again take place across downtown Grand Rapids, Michigan from September 21 to October 9, 2016. Venue registration for the eighth annual event will be open from March 7–April 7, and artist registration from April 18–June 2. Photo: Processing Fiber at 250 Monroe, curated by 2015 ArtPrize Fellow, Elizabeth Hertl.